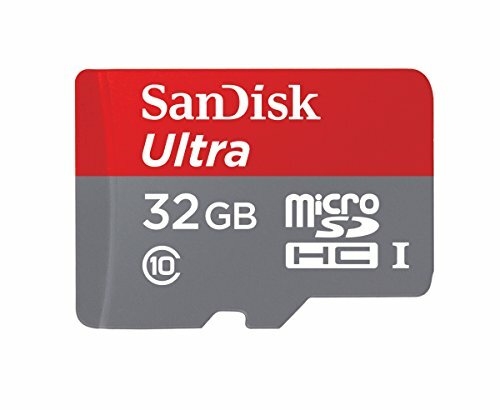 Here are the Best 32GB MicroSD Cards for Mobile Phones, Tablets, Action Cameras & Gadgets in India. Boost Memory, Boost PerformanceMany of you might have experienced the slow-down of processor with the growing number of apps, videos, pictures or other form of files. Now you do not have to delete your favourite apps or data to increase the productivity of your Device. Get Samsung Evo+ Class 10 micro SDXC Card (With adapter) today and bring your sufferings to an end. Avail the benefits of using an EVO Plus series SD card; Transfer or store all your important items to this little memory card and enhance the performance of your smart devices, right away.Petite Size, Huge CapacityDespite being little in size, Samsung Evo+ Class 10 micro SDXC Card offers huge 32GB storage area for all your valuable digital items, such as pictures, videos, movies and important documents. Download and save thousands of song tracks and images and you’ll still have some space to store some more. Now you do not need to worry if your smart-device has less memory or is over-flowing with your important items. 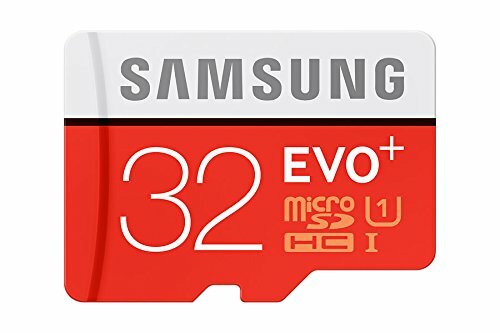 Place Samsung Evo+ Class 10 micro SDXC Card inside the device and get organized.Technology For YouSave all your important files and documents in high speed. Its UHS-I, which means it is compatible to HS interface or devices, so that you can enjoy high speed data exchange and enjoy saving them in a blink. Add more memory to your device and avail the benefits of multi-functionality. This card has Grade 1, Class 10 compatibility feature, which makes it ideal for video recording and capturing pictures. It can also be played in full HD. The reading writing speed can get as high as 80 MB/s, while writing speed is 20MB/s, giving this micro SDXC Card ability to filter videos and apps quicker, along with swift loading and transferring of data. 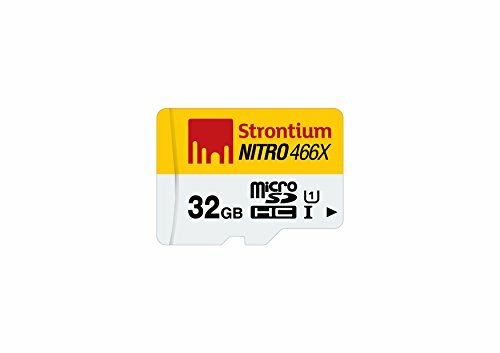 Micro SDHC memory card with adaptor is highly durable and sturdy in nature and is made of special material, which makes it water and heat resistant. Storage Temperature -40? to 85? Operating Temperature -25? to 85? As someone who has jumped on the latest, highly advanced phone, tablet or camera, you’re probably not a big fan of waiting around. And who can blame you – life is short and you’ve got better things to do than wait around for your pictures, movies or music to transfer to your PC. 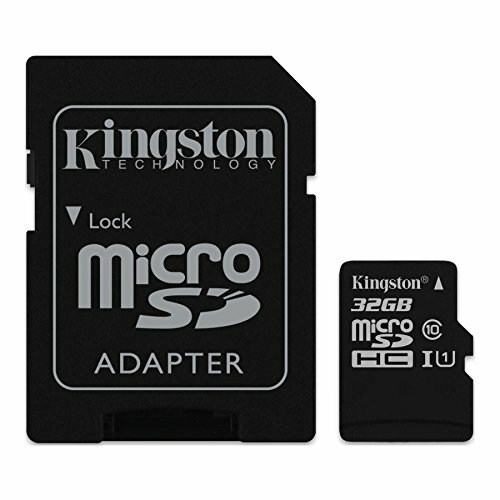 That’s why Kingston offers the class 10 memory card, featuring the fastest speeds available in a microSDHC/SD card. Now you can quickly and easily transfer large photographs, games, videos, music collections and other files to other devices, a PC or the internet – without the long wait. 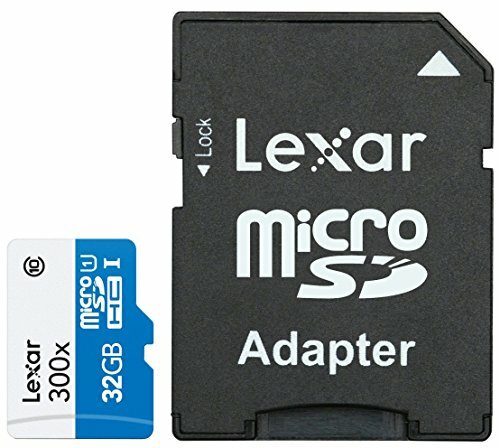 Lexar High-Performance MicroSDHC 300x 32GBMemory CardDo more with your tablet, sports camcorder, or smartphone Lexar High-Performance microSDHC/microSDXC UHS-I cards (300x) make it easy to quickly capture, play back, and transfer 1080p full-HD, 3D, and 4K video, as well as the highest-quality movies, photos, and songs. The cards leverage UHS-I technology to deliver high-speed, Class 10 performance up to 300x (45MB/s), and include an SD adapter for easy file transfer. These premium memory solutions give you the speed and space you need to enjoy more of your favorite multimedia on the go.Product highlights:• Premium memory solution for tablets, sports camcorders, and smartphones. • Quickly captures, plays back, and transfers media files, including 1080p full-HD, 3D, and 4K video. • Leverages UHS-I technology for a transfer speed up to 300x (45MB/s)* . • Stores up to 8 hours of HD video; 24,800 photos; or 14,200 songs. 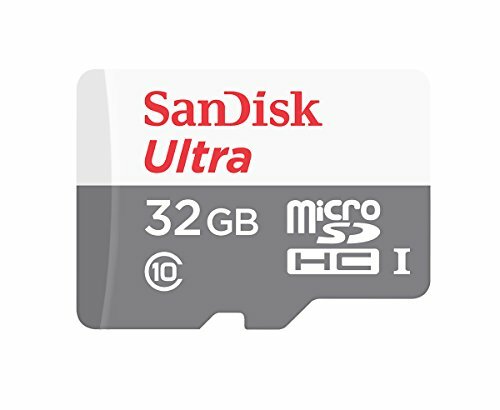 • Includes high-speed, Class 10 card and SD adapter – microSDHC 32GB (Class 10). • Up to 45MB/s read transfer, write speeds lower. • Speeds based on internal testing. x=150KB/s. 8-megapixel JPEG. 128-kbps MP3 audio. • HD 1080p@24fps (5 Mbps). Actual number of photos, songs, and hours will vary depending on camera/device model, format resolution and compression, usable capacity, and bundled software. Some of the listed storage capacity is used for formatting and other purposes and is not available for data storage. 1GB equals 1 billion bytes. Note: Easily transfer files with included adapter. Cards also include an SD adapter to easily transfer files between your devices. Speed rated at Class 10, High-Performance microSDHC/microSDXC UHS-I cards leverage UHS-I technology to deliver a transfer speed up to 300x (45MB/s). 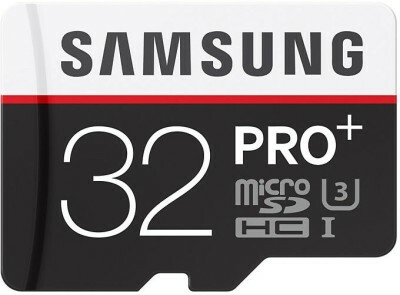 Samsung’s ultra-fast PRO Plus microSD Card sets the standard for extreme sports & action photography. This UHS-I Speed Class 3 (U3) and Class 10 compatibility card is perfect for 4K UHD video recording & playback. And with blazing-fast read & write speeds of up to 95 MB/s & 90 MB/s respectively, you can transfer files and shoot photos with minimal lag. Get the most out of the latest 4K UHD video-enabled smartphones, tablets, and action cameras. This memory card works perfectly with even the most advanced devices to protect your memories for life. Waterproof: Samsung Memory Cards can survive up to 72 hours in seawater. Temperature-proof: These memory cards can endure temperatures from -25° to 85° Celsius. X-Ray-proof: Protect all your data from damage caused by airport X-ray machines. Magnet-proof: Samsung Memory Cards can even resist magnetic fields of up to 15,000 gauss—the equivalent of a high-field MRI scanner.